Let’s face it, no one has an unlimited budget – unless they recently won the lottery. In which case, congratulations! When it comes to many big-ticket items in life there also comes a budget, such as weddings and a new home. This same concept also applies to interior design and creating fabulous high impact spaces. You absolutely could spend top dollar on everything, the question is whether that is necessary? There are certain elements you should not cut corners on – there is a fine line! To splurge or to save? That is the age-old question – keep reading for our answers on how to maximize the style in your space and save money! 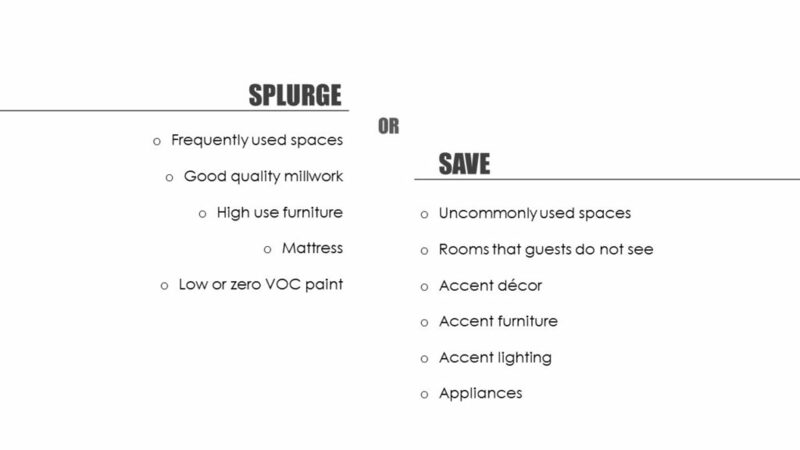 There are a handful of things that you should splurge on and the rule of thumb is to invest in the areas and things that are used the most. Think about your typical day and figure out where you spend the most time in your home. Chances are, you spend a lot of time in your kitchen, bedroom and living area – those are the areas you should invest your money in. In your kitchen and bathroom, you should invest in good quality millwork. In general, millwork is always a big-ticket item, but nothing is worse than having to replace it after a few years because the material is failing or the install was not done well. Make sure you have a hardworking countertop such as quartz that comes with a warranty. The last thing you want is to be fretting over the wine that spilled on your counter and having a permanent stain after a few parties. We love the Fresh Concrete from Caesarstone. They have a visualizer tool on their website which is also very helpful if you are planning a renovation. Which furniture in your home is most commonly used? Consider your lifestyle. Do you constantly host dinner parties? Have the gang over to watch hockey games? Do you love to hang out with your friends? We often suggest investing in a great sofa or sectional. This tends to take up a lot of visual space and is often the most utilized piece in the home. Whether you want something comfortable to relax in after a hard day? Read a book and take a nap on the weekend? A great space to entertain or a structured sofa to double as your occasional office. If furniture is constructed well with a good frame and hard-wearing upholstery, it could last you years! On that note, you should definitely splurge on pieces that impact your health such as your mattress. Spend time researching and shopping around for one that works for you (and your partner). The benefits of a good night’s sleep are priceless. Paint is one thing that most people would not spend a bit more money on, but really should as it has a greater impact on your health that you would think. Most paints while they dry, release volatile organic compounds (VOCs) into the air. Have you ever walked into an enclosed stairwell that was painted ages ago and still smells like wet paint? That is the VOCs from the solvents off-gassing. We recommend looking for a paint that has low to zero VOC content. Yes, it does cost more, but you won’t be breathing in harmful compounds all day. Note the more expensive paints often cover with fewer coats and are easier to use. So less work for you. Believe it or not, there are tons of things you can save on. Now we can all breathe a sigh of relief! As we hinted at earlier, these would be the spaces that you use the least or are not often seen by guests (if that matters to you). Some spaces can be the laundry and mud room, which should be functional and can be more utilitarian. You will probably stress a bit less when you know that the kid’s sports gear has a home and easy to find before the next game. Did you know that Ikea has a storage planner online to help you design your own space? The other areas such as the basement rec room, kids playroom and patio might be areas you can try to outfit with less costly pieces. Another rule of thumb is to save on pieces that include the word accent – décor, furniture, and lighting. These are the items that are not 100% necessary but are nice to have to add some oomph to your space. In terms of furniture, you can save on the side tables (have you checked out some of the options from Blu Dot? ), accent chairs and nightstands. Things that go on these pieces such as table lamps, toss cushions, throws (how about the chunky cable knit from CB2) and décor should very low on your spend list. Find the best possible deal by keeping an eye out for sales and clearances. If you are so inclined, you can possibly DIY or thrift some of these items too. Just remember before you go overboard that less is more and a few curated items are better than too many. Finally, one area that you can also save on is the appliances. Yes, it is very tempting to buy the high-end refrigerator with all the neat functions, but will you really use them all? Go for something in the mid-range that suits your needs. Remember that you are paying for the bells and whistles, so make sure you will actually use them. Will you really connect the app on your phone to start the oven? Do you really need a touchscreen on the fridge door? Can you figure out what temperature to bake a pizza or do you need the appliance to program it for you? Don’t get us wrong we love the luxury brands, but if you need to stretch your money there are still options that offer function (maybe with a bit less sleek appeal).